Got a crowd coming over? Bake up a few of these delicious tarts and watch them disappear. Spray counter lightly with cooking spray. Combine rolls and roll into an 11×15 inch rectangle. Place into a sprayed 9×13 inch baking pan, making sure there is dough going an inch up sides of pan. Cover with plastic and let rest while preparing other ingredients. Remove plastic and press dough to fill bottom and an inch up sides again if necessary. Poke with a fork several times to prevent bubbles from forming and prebake at 350 degrees F 10 minutes. Remove from oven and cool slightly. Brush edges of crust with olive oil. Spread crust with mustard. Lay prosciutto over mustard, top with onion rings and then cheese. Lay asparagus over cheese in two rows with each top going in the opposite direction from the one before it. Brush with olive oil and salt & pepper to taste. 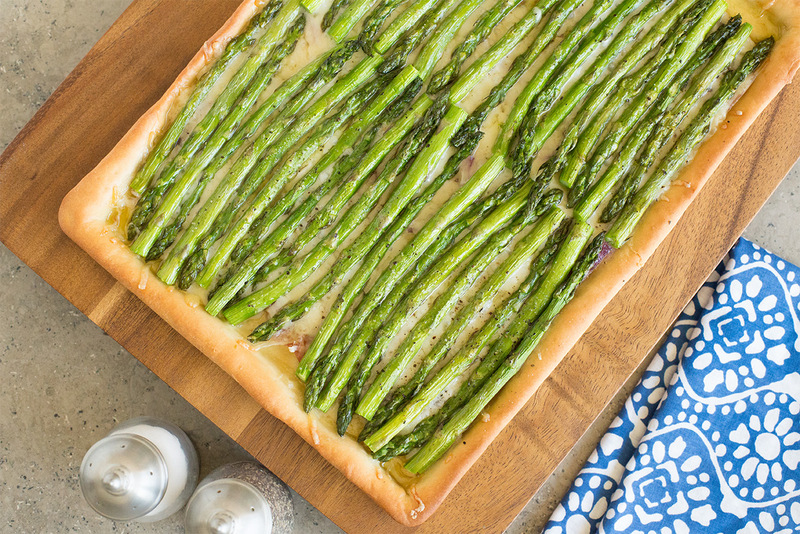 Bake at 350 degrees F 15 minutes or until asparagus is tender.